Head of Karabük University Faculty of Engineering, Computer Engineering Department and Karabük University’s internationally acclaimed journal JESTECH Editor-in-Chief Ed. 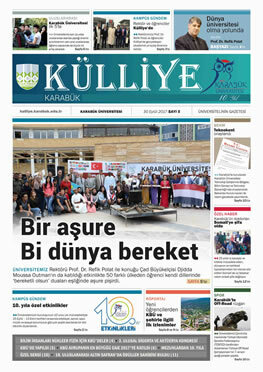 Dr. Mehmet Akbaba announced that it received the magazine’s prestigious ESC index coverage. Professor Dr. Akbaba said that thanks to strong and hard-working editors, the Jestech journal started very quickly. “In a very short period of time, we have come to intensive articles from academicians of universities in China, India, Middle East countries, Africa, Europe and America. Every month 400 articles in our magazine, which takes more than a pretty high level of Scopus-based system using a powerful international arbitration selectivity is accepted for publication a maximum of up to 15% of those articles. He said in a short period of time thanks to this magazine selectivity, Scopus, EBSCOhost, the Directory of Open access journals (DOAJ), Academic Search (EBSCO), Academic Search Primer (EBSCO), TOC Primary, omnifil Full Text Select and Science and Technology took it under the scope of international indexes. Expressing that the magazine proved its international quality, Prof. Dr. Akbaba added “more important than all these indices, ESC the most prestigious journals in the field of engineering and science in the third index in August 2017 (Emerging Sources Citation Index) were included. ” JESTECH magazine will be the world’s second-highest index of SCI Expanded scope in one or two years.”, he said. At the end of the explanation, he thanked all the contributors to the magazine.